You can always order online 24 hours a day, most of our radio codes are displayed instantly after purchase. You can give us call on 01942 604333 ( Mon - Fri 9am-5:30pm ) use our live chat or send us an email 9am - 7pm, 7 days a week. , We only supply working radio codes with over 100,000 customers served. Our decoding service is available 24 hours a day 7 days a week. All radio codes are displayed instantly after checkout. For some radios you can view your serial by pressing & holding 1 & 6 or 2 & 6. Expert's On Hand To Help. Showing your Ford Radios serial code on the radios display. Turn on your radio and hold the preset buttons 1 & 6 for 2 to 3 seconds, the code cycle will begin, wait until your serial shows and make note. It will look like the image below . If buttons 1 & 6 do not work, try holding button presets 2 & 6. The radio serial will display on screen. 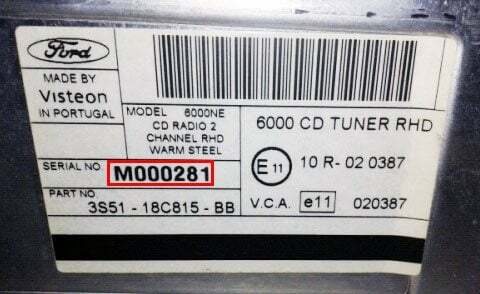 Finding your Ford radio serial on the radios label. 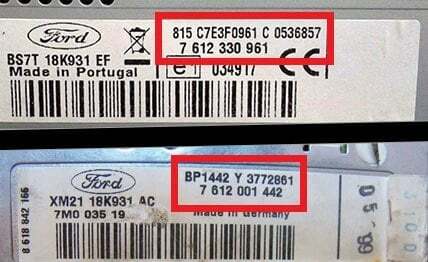 There are 3 types of Ford serial numbers, to find your serial number, you will need to remove the radio using radio release keys. Once the radio has been removed you will need to locate the radios label, which is on the top or side of the radios casing. When the radio is turned on 'CODE' should display on the radios display. Repeatedly press button 1 until the correct first digit of the code is displayed. Repeatedly press button 2 until the correct second digit of the code is displayed. Repeatedly press button 3 until the correct third digit of the code is displayed. Repeatedly press button 4 until the correct fourth digit of the code is displayed. 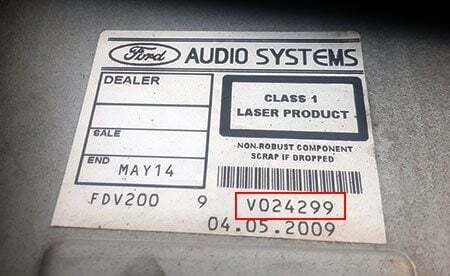 To Input Your Ford Radio Code, simply press button 5 or Enter and your radio will start to play. If 'CODE' does not appear immediately, press 'SELECT' momentarily, then 'CODE' should appear on the radios display. If you have entered the code correctly on the radios display, simply press the 'SELECT' button to enter. 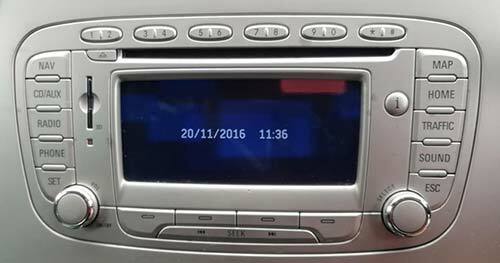 Why Choose us to Decode your Ford MAX Radio? First and foremost we value customer service, it is one of our core values and why we are one of the very few companies to offer a money back guarantee. We go above and beyond to give our customers the fastest and most knowledgeable service, rest assured your in safe hands. OnlineRadioCodes.co.uk is the U.K's No.1 Radio Code Company. We was established off the back of many customers not being happy to pay the prices of local garages and dealerships to unlock their car radio. Once you have the serial number for your MAX radio, enter this into our simple 3 step process to get your radio unlock code online. Most of Our Ford MAX radio codes are instantly available, and display on screen after purchase. You can also call our radio experts on 01942 604333 to obtain your radio decode instantly over the phone via credit or debit card. Our phone lines are available from 9am - 5:00pm (Mon - Fri). We also offer a free Ford MAX radio code lifetime code retrieval service, so if you ever misplace or lose your stereo code you don't need to worry! The code we provide is the original code for the radio supplied when the vehicle was first manufactured. Radio decodes are requested directly from our large databases or decoded in house by our specialist radio decoding tools. *Disclaimer: Please note that Online Radio Codes is a independant website and in no way authorised by, connected to or otherwise associated with 'Ford Motor Company Limited' all copyrights and trademarks are of the respected owner Ford, we do not sell or provide any products that are the same our similiar to Ford. We are car radio decoding specialist and all of our decodes are either obtain through databases which we own, or via in house radio decoding tools. All trademarks are copyright to their respective owners.